Even though we were staying right on the beach (bay side) at Cape Cod we still took one day to go over to an ocean side beach for the waves and hopefully fewer rocks. We were not disappointed. We went to coast guard beach which is part of the national sea shore. It was beautiful and very exciting. The pictures can’t do it justice but the waves were huge and unforgiving when they crashed on you. The water level would go from nothing to up to your waist in almost an instant. It is a great fun place to go with older kids and adults that want to play in the (cold) water. Once you got past where the waves broke it was very deep but very calm and relaxing. We also saw a seal playing just a bit off shore! Josie didn’t really want to go swimming anyway so the waves didn’t bother her, although she got wet without planning on it at times. 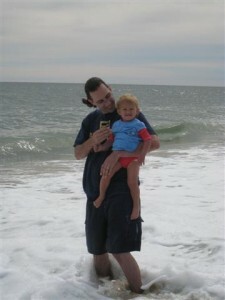 At one point I was trying to amuse her by running towards the water when the waves went out and away when they came in. 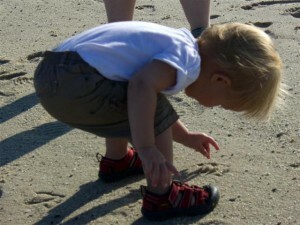 I did this a few times but eventually lost my balance in the soft sand and a big wave came in and creamed me. I went under, flipped over, and waited until the wave subsided to surface. I get up and find Josie with a huge smile and signing ‘more’, meaning that I should do it again. I declined. 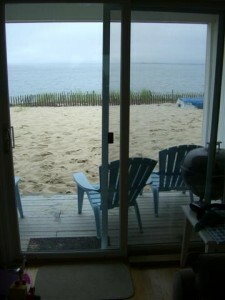 We had a fantastic time on the beach in Truro at Cape Cod in a townhouse we rented right on the beach. 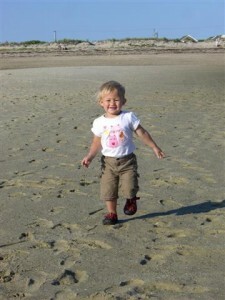 Josie loved being able to play in the sand and we had a good relaxing time with my parents being around and helping entertain her. Josie loved the seagulls and throwing rocks into the water. She also moved sand around in a very important business-like way. 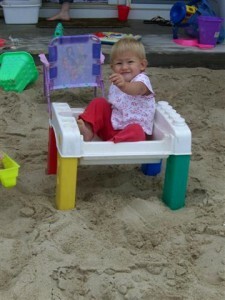 This is one of the first things she did, she made a reverse sand table. She put the table in the sand and climbed up on top. In the beginning she wasn’t too sure about the sand and how it felt and how safe it was. She never really got to like the beach down by the water where it was rocky. One day we went way down the beach to a sandbar and she really enjoyed it because the sand was flat and there were no rocks. We also saw a dead crab and made our way out to self[-proclaimed ‘Jennifer’ island before the tide came in and the island went under. 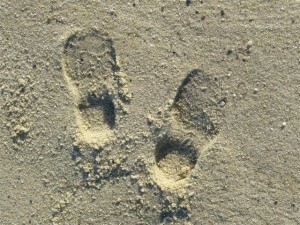 And my baby’s cute little footprints in her Keens. These shoes were awesome, too bad summer is over! My parents both bought some Keen’s for themselves, at least those will still fit next year. Josie loves to point out cats. This video is a month and a half old. Oh boy a new playground, what’s that 15 foot tall thing over there? Week before last, before our zoo membership expired, I decided to make a solo run to the Franklin Park Zoo. I was a little nervous as this place is big and Josie is known for wanting to be carried everywhere and it was a hot day. Nevertheless it went very well although every time I tried to take her picture (backing away slightly), she’d get very upset. Even when said photo is next to drawings of animals, not actual animals. Therefore I don’t have many photos nevermind good ones. She was done looking at each animal very quickly. About ten seconds after we got there, she’d say ‘all done’ or ‘bye bye’ and be on the lookout for another one. Then again all the big sleeping cats aren’t a novel sight really either. I enjoyed getting to point out the pictures in her books of the animals that we saw! Her favorite part was unquestionably the playground. She was fairly attentive to the chickens, ducks (great we don’t see those everywhere already! 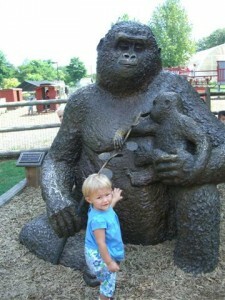 ), gorillas, and the prairie dogs. She also pet a goat, but not the black one, the cream colored one was the only acceptable one, the black one made her cry. All in all it was a nice mother-daughter bonding day at the zoo and got us out of our normal routine. You are currently browsing the JenJordi.org weblog archives for September, 2009.